When the X-Men title ceased publication of new material and shifted to reprints of prior stories, a number of the original covers for those stories were replaced with new work by artist Gil Kane, just as was the case in other reprint titles such as Marvel's Greatest Comics, Marvel Triple Action, and Marvel Tales. 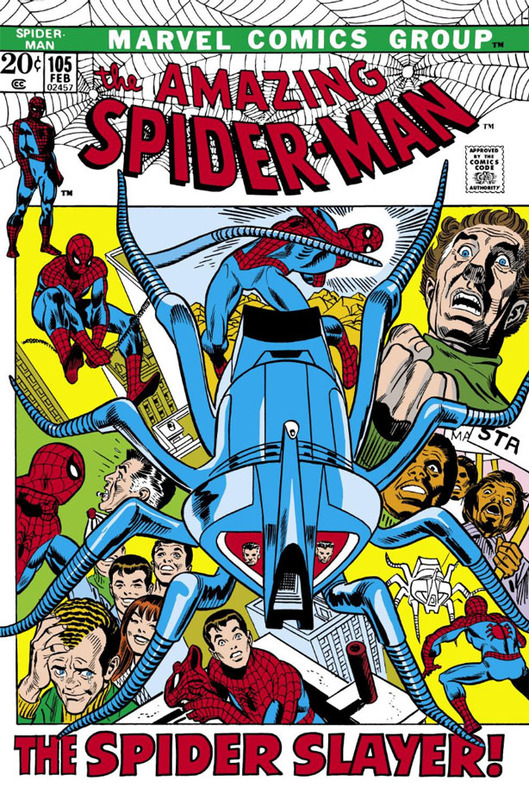 In all of these cases, the decision was eventually made to return to and reuse the original cover art and simply make alterations or adaptations where needed--which was likely no reflection on Kane's work, since other artists could have been tapped to do new work if Marvel had wanted to continue in that direction. 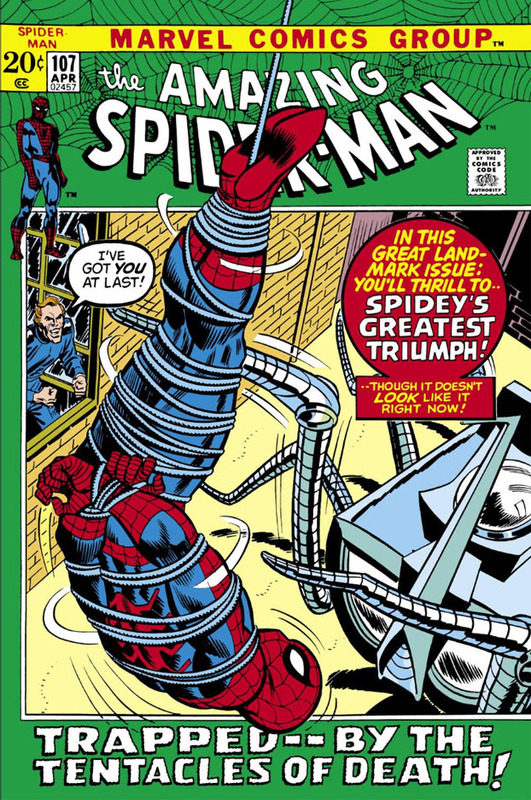 Perhaps it was simply deemed that the original art was still viable enough to pull "double duty" in terms of reselling the story, while keeping in the spirit of re-presenting a classic story in its entirety. 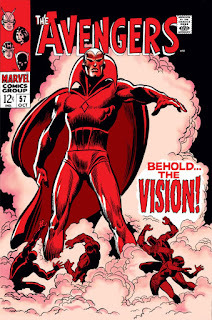 In that sense, Kane's reinterpretations of those covers may have been unsuitable for what was required in a cover image--namely, that the image serve as a clear and dramatic representation of the events of the story within. 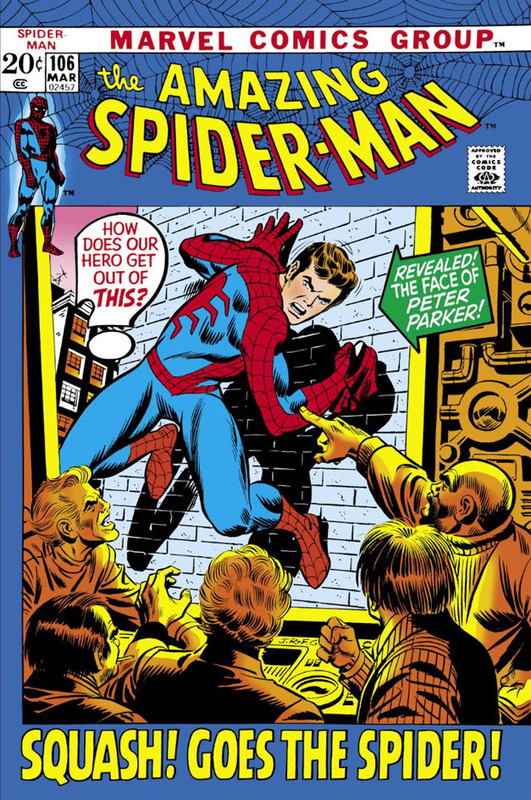 Rather than provide that kind of all-inclusive image, Kane tended to take a "snapshot" approach, treating the cover image as an actual page from the story--and in doing so, crammed perhaps too much imagery into the space available. And when you're talking about a team book, the end result could be a jumble of action that admittedly showed you that a lot was going on but by the same token was difficult to sort out and make sense of. 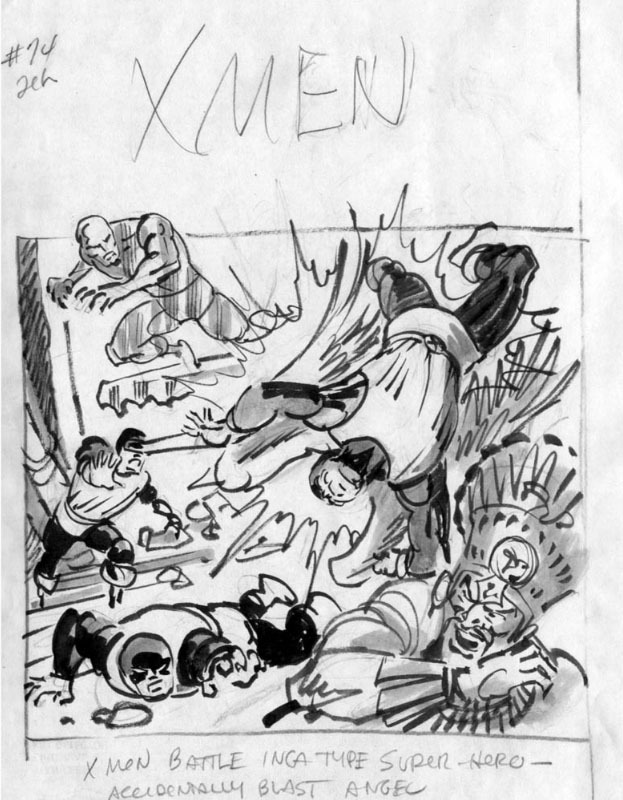 In the climax to a late-1966 story in X-Men, where the museum thief known as El Tigre has achieved the power and status of the Mayan god Kukulcán, the X-Men battle a formidable foe at great personal cost; yet in comparing the two covers to the story, featuring both the original as well as Kane's version for the 1972 reprint, only one of them seems to embody the impact of the team's struggle with this enemy. 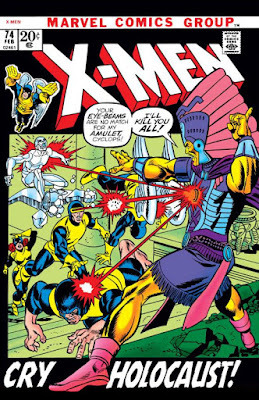 In Kane's image, it's clear that the X-Men are in a fight where, despite their numbers, they're at a disadvantage; after all, if your enemy is able to drop nearly all of your team in a single stroke, it's pretty clear that Kukulcán's claim of being the reincarnation of a Mayan god isn't an exaggeration. But in the original image, pencilled by Werner Roth (with an assist by Jack Kirby, whose handiwork appears evident in the depiction of Kukulcán), the impression that the X-Men are on the ropes comes through loud and clear, even without their enemy firing a single shot from his amulet. 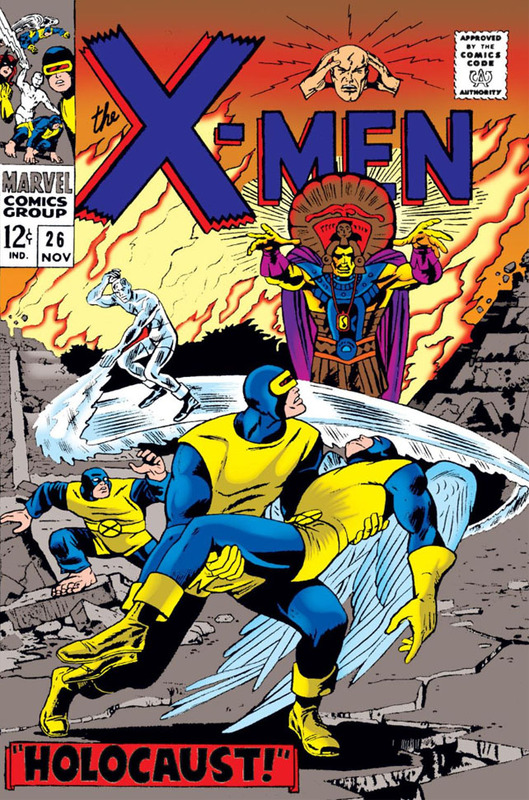 Also, the word "holocaust" is given prominence on both covers, presumably in order to convey the overall effect and outcome of the X-Men's fight--yet which of these covers brings that word to life for you? More than likely, the one with the field of battle going up in flames--with the X-Men apparently out of options and suffering casualties. 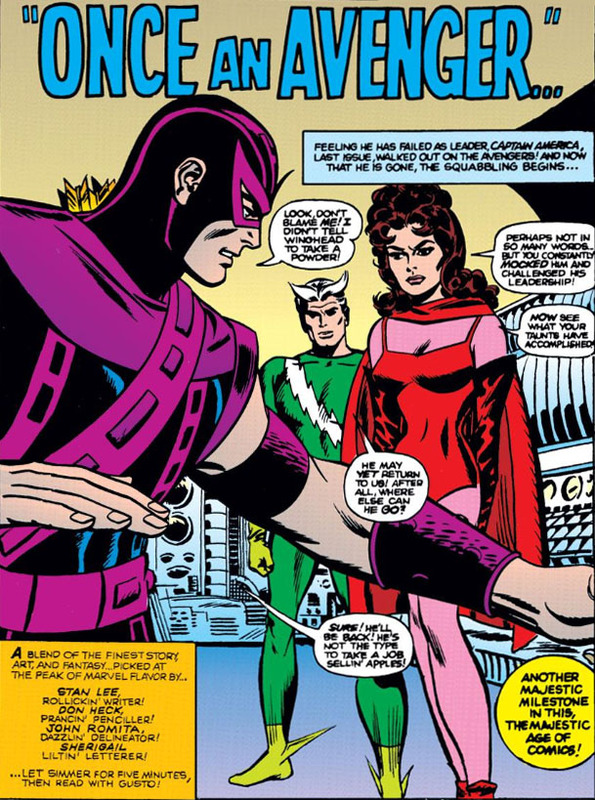 As if Kane's cover isn't busy enough, he also stacks the deck with Marvel Girl, who in the story isn't even present during this battle. In addition, the revised cover completely glosses over the unexpected and near-tragic development of the fight--the critical wounding of the Angel by none other than Cyclops himself, as both were closing in on Kukulcán but who obviously failed to account for each other's intent. Roth's cover portrays the battle's most desperate moment without giving too much away, while still maintaining a heightened sense of danger; while the revised image only conveys the most generic picture of Kukulcán's threat to the X-Men. 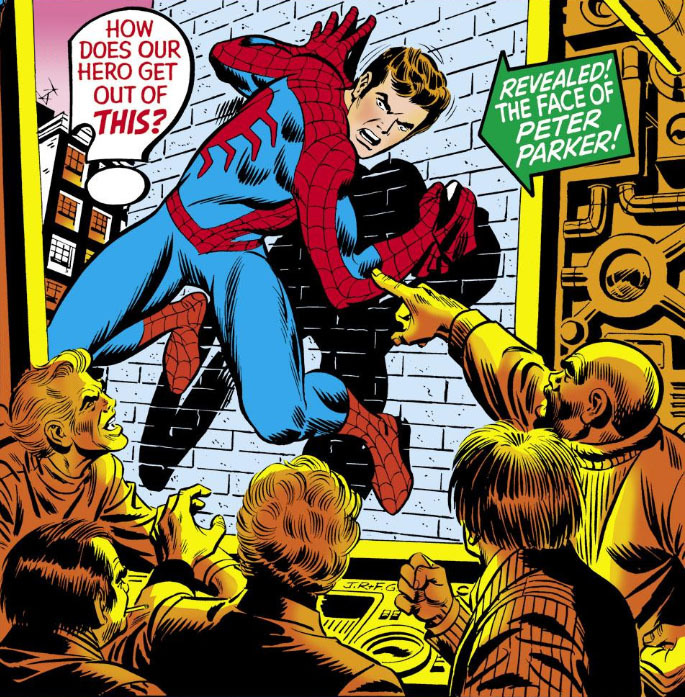 A look at the original conception for the reprint cover by Marie Severin. The Silent, Swivelling Threat of... Big Brother! It's certainly a heck of a cliffhanger we're faced with as the story involving the new Spider-Slayer continues from Part 1, with Professor Spencer Smythe using his new network of rooftop surveillance devices to catch Spider-Man unmasking and revealing his identity as Peter Parker. 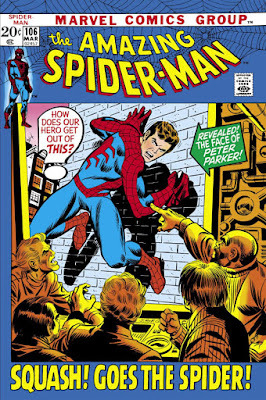 As the caption points out, "How does our hero get out of this?" 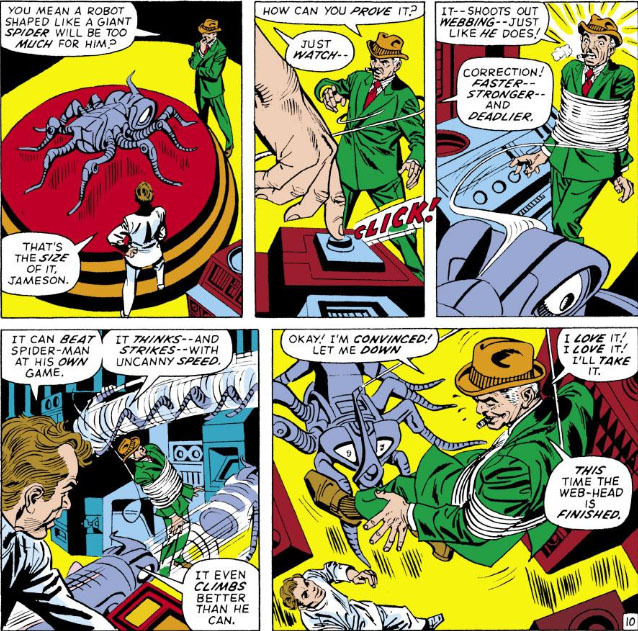 Yet, surprisingly, as far as Smythe is concerned, his triumph against the web-spinner looks sufficiently open and shut to table the matter for the time being, leaving him confident enough to deal with Spider-Man at his leisure while he continues with other aspects of his long-range plans for the camera devices he now controls. To that end, Smythe proceeds to establish ties with New York's top gang leaders and offer his new services that will allow them to stay several steps ahead of law enforcement as they pull off their jobs. 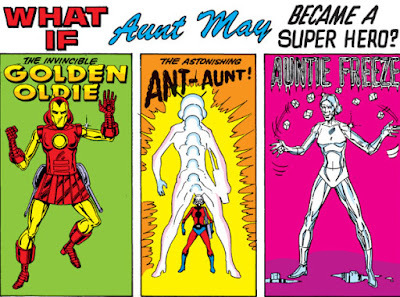 And Smythe indeed gives them a sales pitch too tempting to easily refuse. 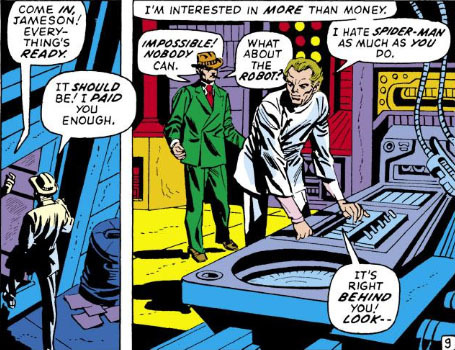 With Spidey's "identity crisis" quickly solved, that still leaves the threat of the Spider-Slayer to deal with--a robot which, unknown to Spider-Man, Smythe has developed even further. 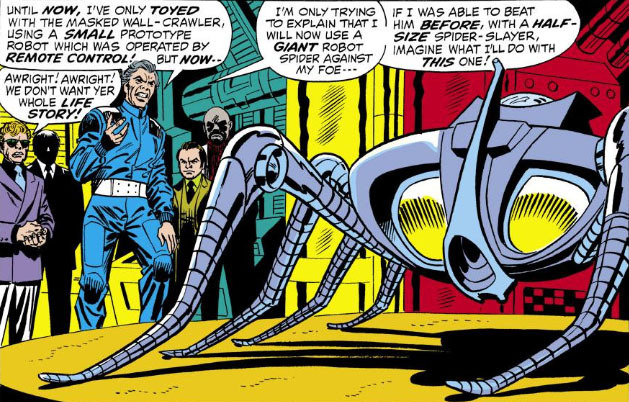 Now that the new Slayer gives Smythe the ability to personally take control of the robot by climbing aboard it, it appears the Spider-Slayer now has a living brain to make it even more formidable. 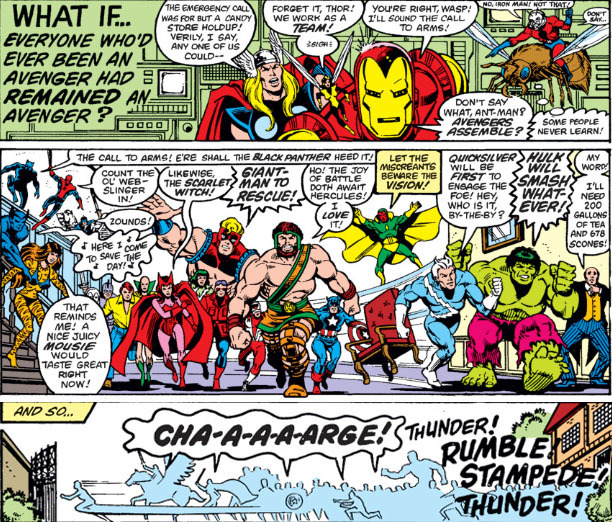 The third encounter between Kang the Conqueror and the Avengers was something of a turning point for the team, now numbering just four members following the departure of nearly all of the original lineup. 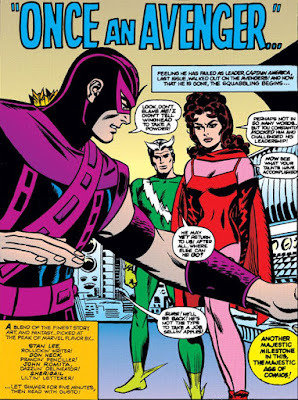 With only Captain America remaining to train the three new Avengers--Quicksilver, Hawkeye, and the Scarlet Witch--it quickly became apparent that his training would have to sustain them and see them through the challenges they would face, since they lacked the raw power of their predecessors and they were fewer in number. One other important difference between the two teams is that these three raw recruits lacked the maturity of Thor and the others, as well as being overly competitive with each other--something which the original team members, having distinguished records in their own right, wouldn't have given even a passing thought to. 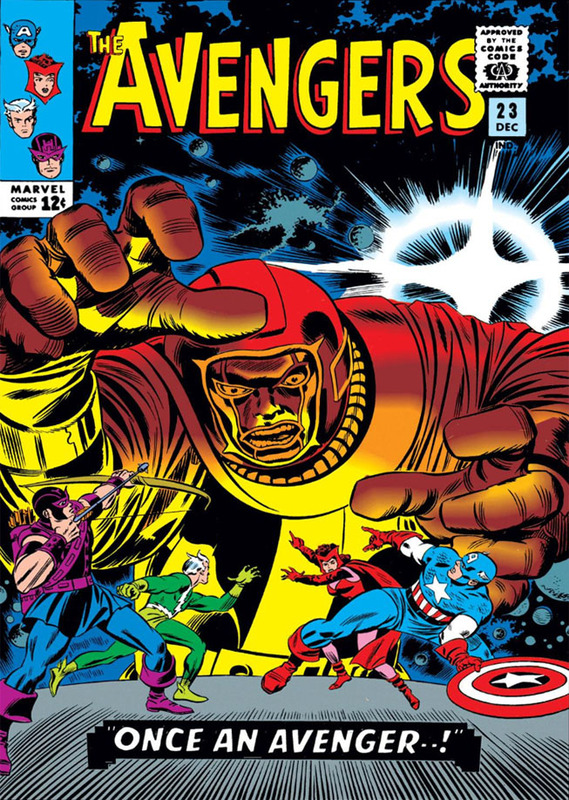 Ordinarily, Cap might have harnessed that undercurrent of competition in his trainees and channeled it into camaraderie and a stronger sense of unity; but, in asserting himself, he often came into conflict with Hawkeye, who bristled at constantly following Cap's direction and orders and whose discontent and temperament began to affect the behavior of his other teammates as well. 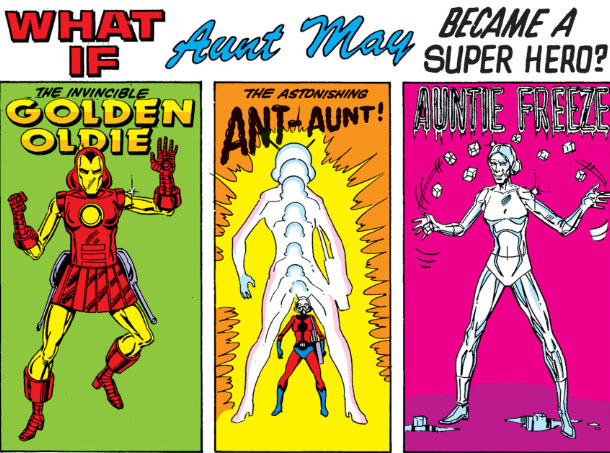 Soon, the Avengers found themselves bickering at the drop of a hat, with only the danger of a current threat holding them together for the short term. It was during the team's desperate battle with the Enchantress and her super-strong ally, Power Man, which led to a moment of truth for the Avengers, where they could either resolve their differences and become a stronger unit or grow even more fragmented than they already were. The machinations of their foes had left them at their lowest ebb--discredited and framed as reckless and unlawful, and eventually declared a public menace and forced to disband. 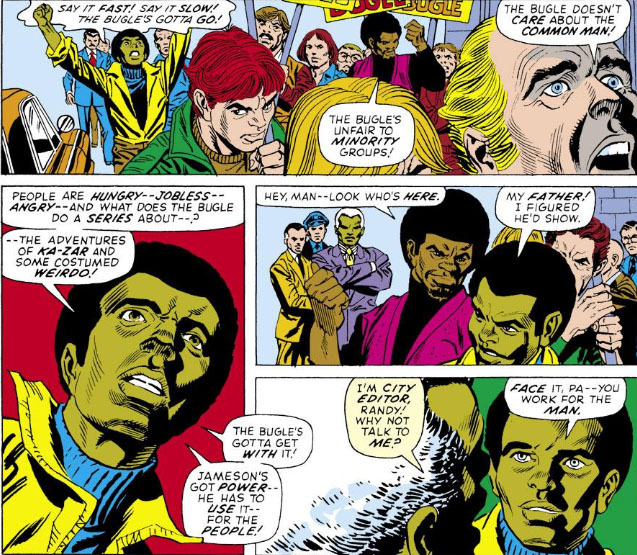 Eventually, Cap was able to uncover the truth about the pair's operation, and the Avengers redeemed themselves with the law and settled the score with Power Man--but the damage was done, and Cap had finally reached his breaking point. 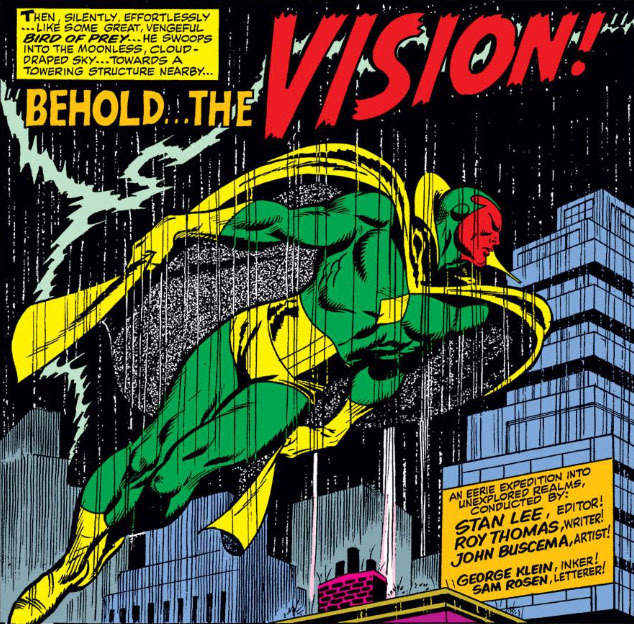 And so the story that follows faces the question of not only if the Avengers will survive, but also whether these individuals are prepared to put aside their petty differences and commit to this team and build it into a force to be reckoned with. With the dust still settling from Cap's abrupt departure, these three are going to have to regroup on several levels before we see indications of improvement. For now, with Cap no longer a focal point for their discontent, it isn't long before the remaining Avengers feel the void of his absence in their ranks--nor has it improved their disposition toward each other. 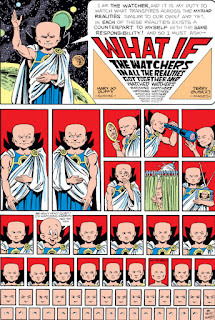 With two differences: Instead of the "story" being anchored by the character of "Forbush Man"--the comic book alter ego of Irving Forbush, a dead-on-arrival fictional Marvel employee that perhaps only Marvel felt was interesting and hilarious to readers--it's the Watcher who's making appearances through the various skits and joke panels that poke fun at the What If concept. 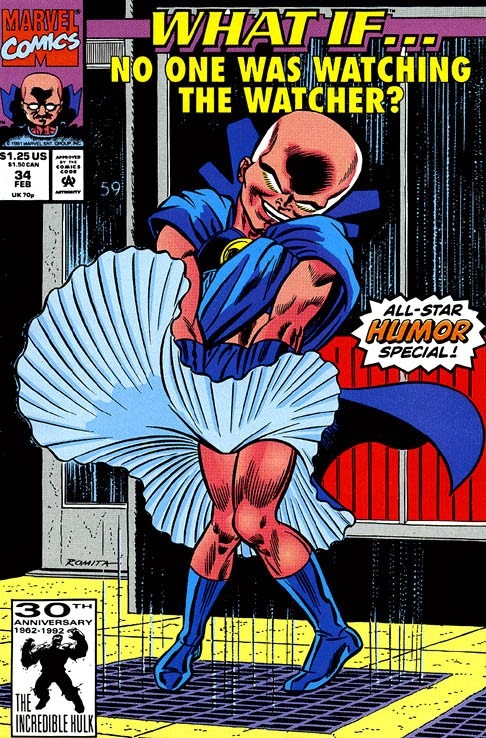 The issue may also not have had the best timing, being just the fourth issue to reflect the title's 25¢ price increase and offering little but throw-away gags for its cover price. 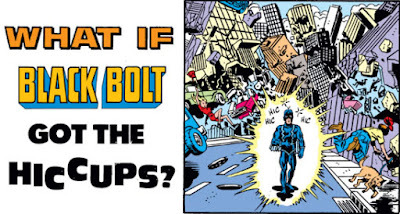 Or, put another way: What If the comic book you'd plunked down good money for--40¢ more than regular-sized comic books on the rack--devoted two full pages to parodies of production staff? 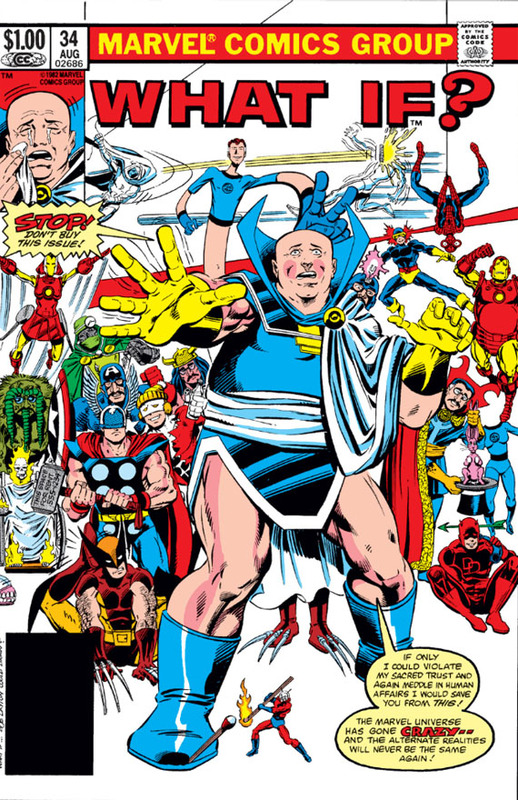 So if you're seeking out What If #34 from late 1982 for whatever reason (if only out of curiosity), bear in mind that it might be a mag that you'll flip through quickly and turn the final page with a shrug. 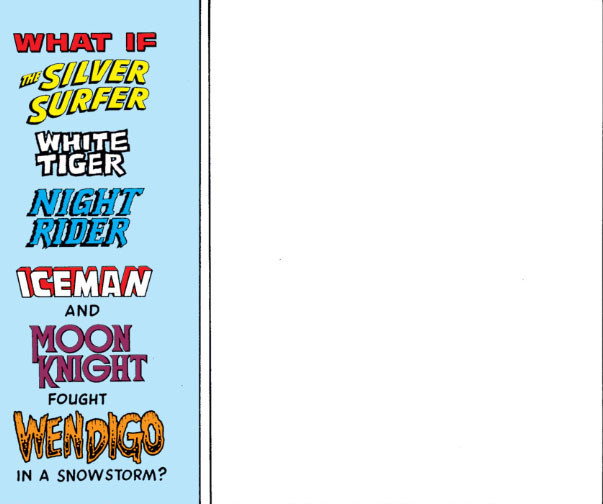 Here are a few of the panels I thought stood out from the pack--your mileage may vary. Almost 10 years later, though bearing the same issue number--a second What If parody mag. With the dismal failure of the previous two Spider-Slayers, as well as the highly suspect motives of their inventor and developer, Spencer Smythe, we have to believe that even the irrational J. Jonah Jameson would think twice about getting in bed with this guy again to go after Spider-Man with yet another robot operated by remote control. 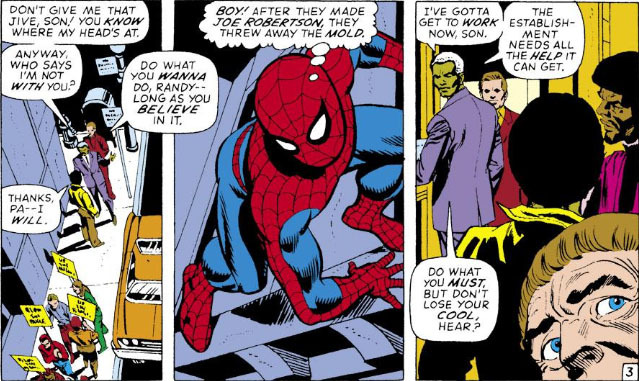 Yet writer Stan Lee shuffles several unlikely plot developments into place in order to make it happen--to say nothing of having the Spider-Slayer move up from a single-story novelty to now act as the foundation for a three-part story. Still, Lee keeps all the plates spinning on their poles throughout this tale, while also having Smythe strike out significantly on his own rather than being needlessly dependent on Jameson (though it may not seem that way initially); but it's the way that Lee puts the story's elements in play that doesn't invite scrutiny. 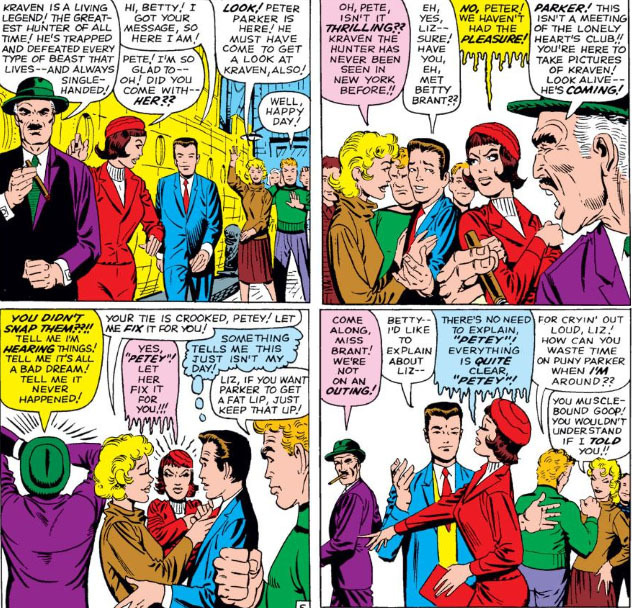 For instance, the story's opening segment--Randy Robertson leading a protest against Jameson's newspaper, the "Daily Bugle"--comes across as a fairly well-handled scene which highlights not only Randy, but also the solid relationship between Randy and his father, Joe, who, as City Editor of the newspaper in question, is an indirect target of the protest crowd. However, looking deeper at the scene, you can't help but linger on Joe Robertson's earlier point. The goal of Randy's group is to compel the Bugle to shift its focus to more serious and socially-conscious issues; yet here you have a member of your protest group with direct access to the Bugle's editor, a virtual open door that leads right to the desk of where your grievances can be addressed, and you don't make use of that connection? It's clear that Joe is willing to meet with the group--why not try that approach first thing? It would be easy to accept the protest at face value if that meeting had already taken place and Joe's response was unsatisfactory, but that obviously isn't the case here. Instead, Randy has organized this protest without even giving his father a heads-up about it, and that doesn't mesh with the relationship between them that Lee is wanting to shine a favorable spotlight on. Then there's Jameson himself, who arrives shortly after Robertson but has a much different reaction to the group's stance. And you know something? 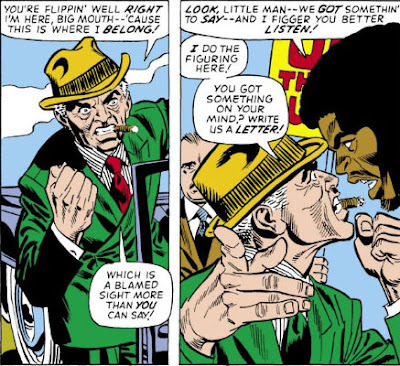 Jameson is right--he has fought for civil rights, as well as taken on corruption and bringing public attention to drug abuse--so why is he taking a hardball approach here? If nothing else, he's canny enough to know that meeting the protesters on the street face-to-face with civility is going to send his paper's circulation soaring; but regardless, given his past, it makes no sense for Lee to have him reject the grievances of the protesters out of hand without giving them at least a couple of minutes of his time (not that Josh couldn't have used a less confrontational approach himself). Corporation executives might have given the protesters this kind of brush-off--but a seasoned newspaper man? 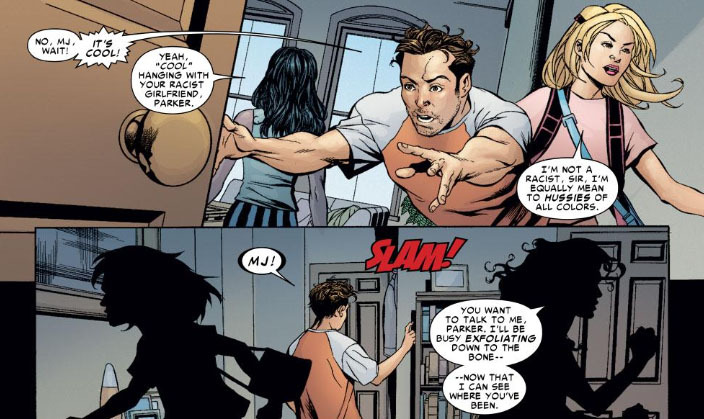 At any rate, Lee's structuring of this scene is likely meant to open the door for Spider-Man's involvement, which would subsequently lead to Jameson putting the main focus of this story in motion. As Lee's story with the Spider-Slayer takes shape, he has plenty of story filler to work with in Peter Parker's life in the course of three issues, in order to supplement the material with the Slayer; for instance, Harry Osborn, who is beginning to take the road back to recovery after his experience with using drugs. 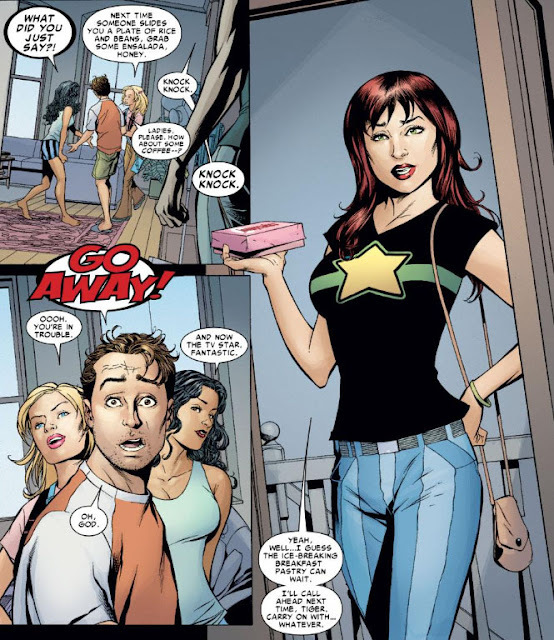 Lee also features the return of Flash Thompson from military service, while indicating that something isn't quite right with him (a plot which would lead to a later story of its own). 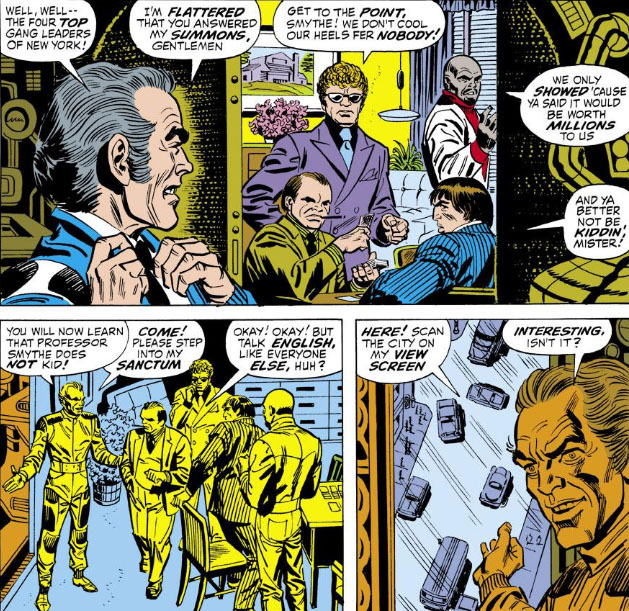 As for Jameson, he takes a surreptitious meeting with Smythe, in order to preview the new Spider-Slayer. 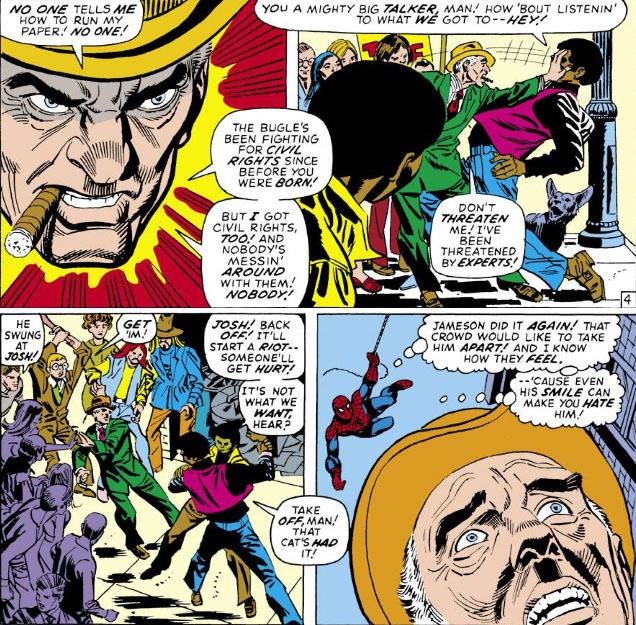 The way that artist Gil Kane has laid out the opening scenes with Jameson and the protesters, you might conclude that it's Spider-Man's intervention and subsequent public humiliation of Jameson that motivates Jameson to contact and renew his ties with Smythe; instead, Lee makes it apparent that Jameson had already decided to make arrangements to meet with Smythe, well before his encounter with Spider-Man. 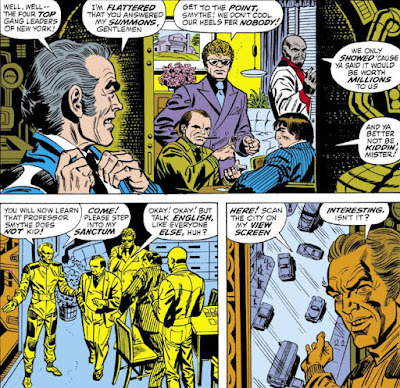 The former would have made more sense for the flow of the story; as it is, we can only wonder at Jameson's reason for contacting Smythe once more, given that he wanted nothing more to do with the man after their last debacle. 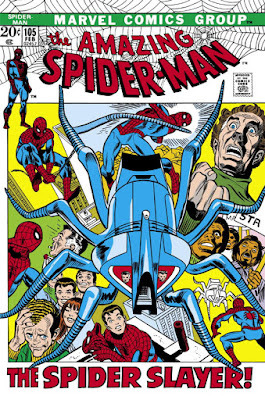 And so the new and improved Spider-Slayer begins its hunt for Spider-Man, with Jameson once more at its controls. 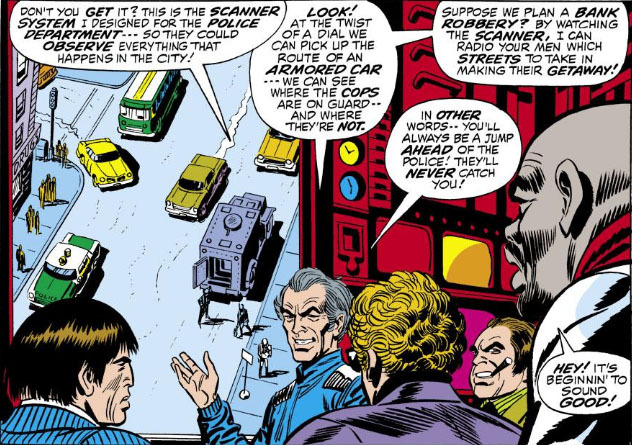 But Jameson may find himself less in control of this undertaking than he yet realizes--though for Smythe, all is going according to plan. And you thought the Thing had women admirers. 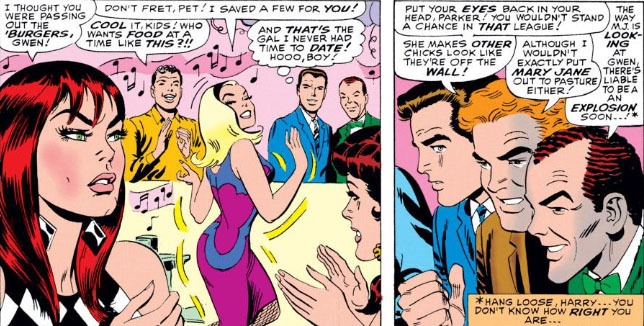 Ben Grimm has nothing on Peter Parker, who, like, Ben, has been known to have women vying for his attention--though there were occasions when it seemed the vying might lead to open hostilities! 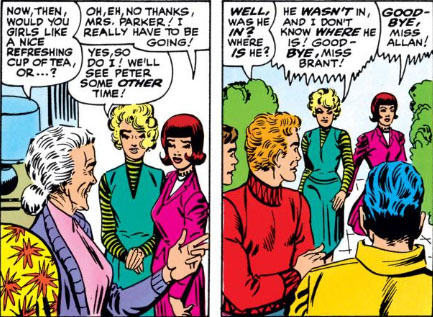 Peter's difficulties (yeah, we should all have such problems) go as far back as high school, when a not-so-friendly rivalry developed between Peter's girlfriend, Betty Brant, and his classmate, Liz Allan. It was dislike at first sight. And if you thought things were just going to ease off between these two--I'm sorry, but have you met women?? 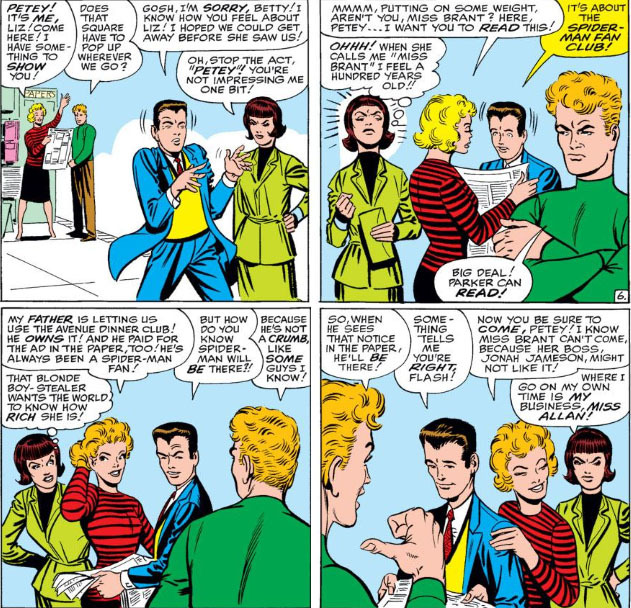 If Liz and Betty are any indication, you can generally tell how well one rival is doing by the amount of fuming the other one does--and Betty seems to have fuming down to a science. 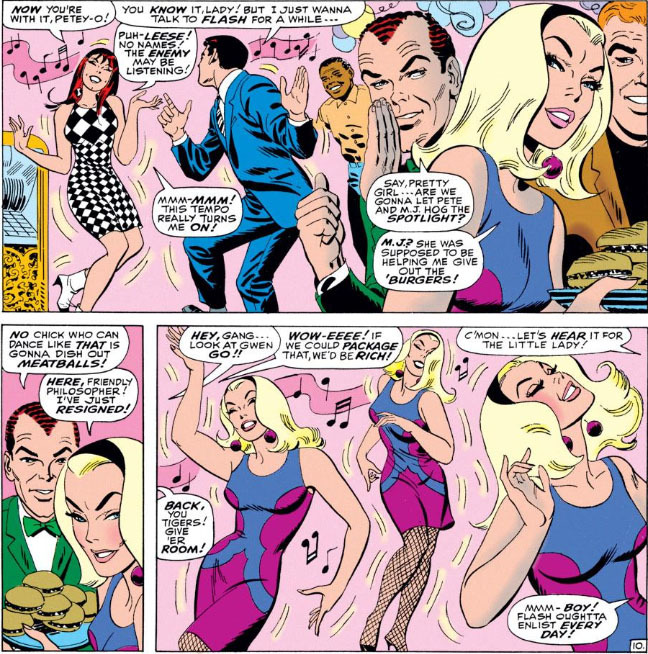 Fortunately for the innocent bystanders, who usually tend to go out in public without thinking to don flak jackets, the rivalry between Betty and Liz is rendered moot when a third bombshell is added to the mix--the vivacious Mary Jane Watson, a girl Peter has yet to meet but, even waiting in the wings, makes enough of an impression on these two to make them realize that their days are numbered when it comes to their chances with Peter. It's around this time that Betty begins dating Daily Bugle employee Ned Leeds--and when MJ finally makes the scene, readers were probably asking themselves "Betty who??" At the same time, Peter's eye (along with that of just about every guy at the "Coffee Bean") was also wandering in the direction of Gwen Stacy--and though MJ tended to gravitate toward any guy who could provide a fun time, even she began becoming a little jealous when Ms. Stacy found herself in Peter's orbit. Nor was Gwen about to play second fiddle in even a friendly rivalry. 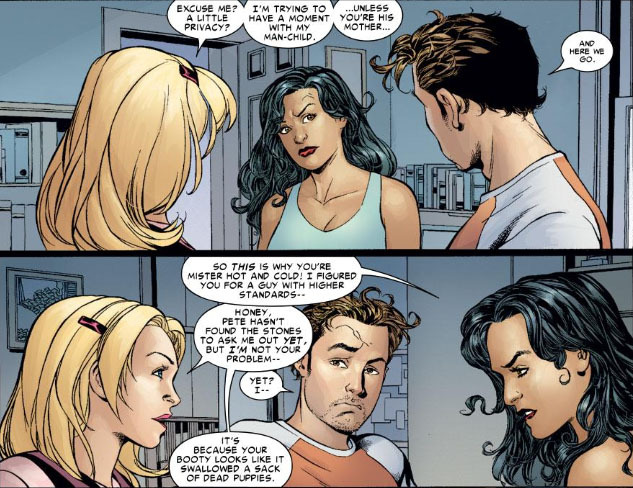 Of course, things didn't always go so smoothly for Peter in the love triangle department--especially when Ms. Watson was around to complicate matters. 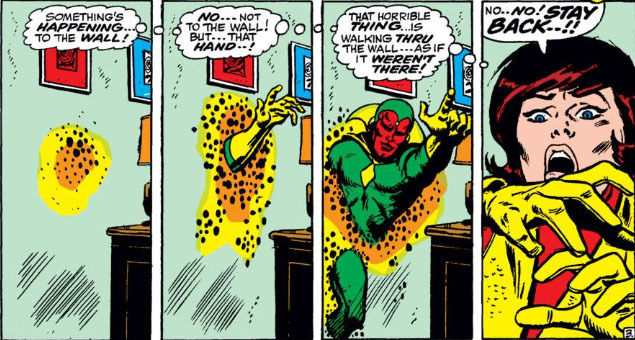 For instance, a war zone in your own apartment is never a good thing. Oh for the days of fuming, eh, Peter? The character of the Vision, the creation of Roy Thomas and John Buscema and the second comics character to carry the name, may have long ago lost his original appeal as his evolution and handling spun wildly out of control; but there's little argument that the classic cover of his first appearance stands out to this day, almost 50 years later. It's a memorable image that takes its cue from the introduction of the original Vision from 1940--"Aarkus, Destroyer of Evil." 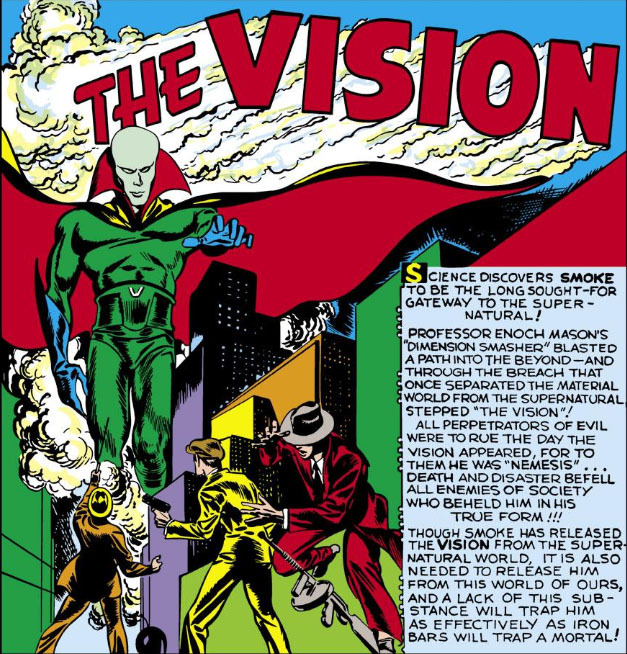 Unlike his earlier other-dimensional namesake who depended on smoke for his entrances and exits, the Vision from 1968 was the creation of a sadistic mechanoid that held enmity toward the Avengers (and one Avenger in particular)--a being who first appeared as the Crimson Cowl but has now moved on to another phase of his plans for the team while embracing the identity of Ultron-5. 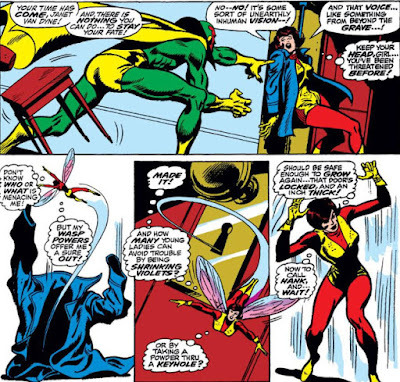 And it appears that phase involves the use of a formidable and deadly assassin. At Your Side Stands... the Valkyrie! 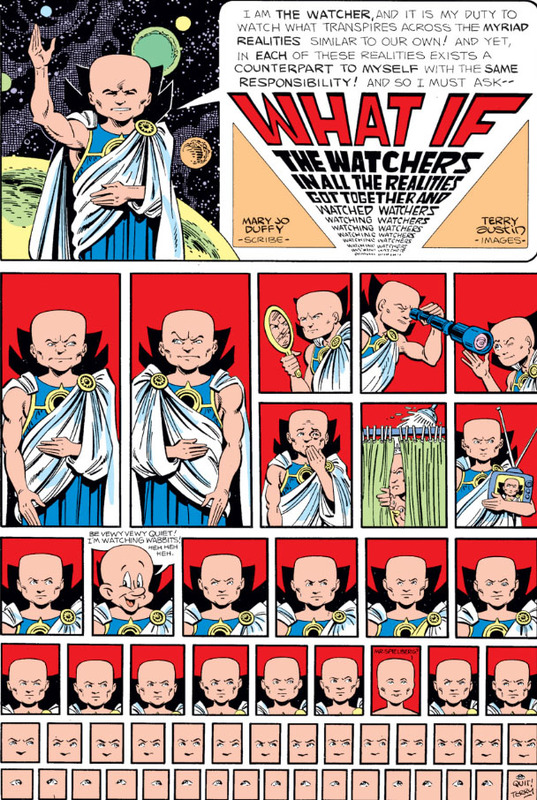 The Final Plan of the Absorbing Man! 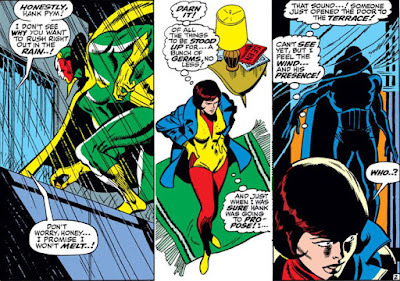 When Rages the Dark Phoenix! From The Ashes Rises... Jean Grey! ?